Under Armour Test Of Will 2018 | JustRunLah! The annual urban fitness challenge, Test of Will, returns for its third edition on 7 and 8 April 2018 at Ngee Ann City in Singapore. 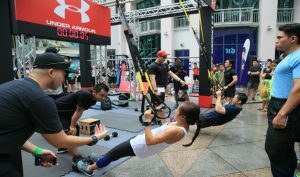 Organized by high performance sportswear label Under Armour, the event celebrates human performance through intense functional training challenges for the most determined athletes, goal-getters and fitness aspirants. The highlight of this year’s Test of Will challenge includes the introduction of three age categories to level the playing field (18-34 years, 35-44 years, and 45+ years). Dialling up the intensity from last year, 2018 participants will compete in an all new four-minute circuit challenge – Over and Under (Hurdle), Deadball Squats, Kettlebell Farmer Walks and Bear Crawls – that will test their strength, endurance and power. Each competitor will be scored based on the maximum number of correct repetitions they can achieve within 60 seconds. The Top 3 male and female athletes in each category will receive a limited-edition Test of Will 2018 medal. This year’s Singapore Test of Will champions (male and female) who achieve the highest overall score will walk away with a cash prize of SGD1,288 each. Under Armour has also recently launched its latest training apparel and footwear collections, Threadborne Vanish, engineered with its signature Threadborne technology leading up to the Singapore heats; to equip participants with the gear to train and compete at the highest level. Participants are encouraged to study the training guide for specific movement standards and tips to maximise their performance. They can also sign up for the Test of Will 2018 Training Camp, a brand-new training program from TripleFit consisting of group classes that are designed to refine technique and give them the fitness and game plan to tackle this year’s challenge with confidence. For more information on the Test of Will 2018 Training Camp, visit here.